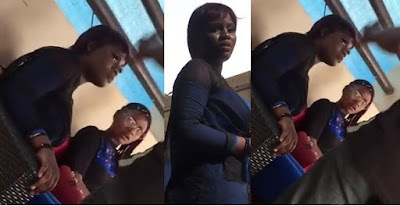 INTERESTING: Slay Queens arrested in Lagos for allegedly stealing wrist watches ~ The Big Thing In Town!!! An unidentified man has been the victim of theft perpetuated by two slay mamas who allegedly stole from him. He however got officers involved and they were arrested by SARS officials. An Instagram user named Jordanstyl shared the clip of the girls being whisked away from Akowonjo De Santos hotel in Lagos. According to the victim, he met one of the ladies by the ATM close to his house. They got on chatting and she requested he host her in his home. Being a love interest, he obliged and invited over to is apartment. The lady accepted the invite and showed up with a friend on a certain day. They were together having fun when he had to briefly step out of the house, leaving his new friend and guest behind. To his surprise, on his return, the girl and her friend had fled with some of his personal items including a gold wrist watch worth N420, 000. Instagram user, Jordanstyls shared the clip with the caption "So I was out today with my friends, and this happened; two ladies (runs girls, aka slay Mama) were set up to meet at Akowonjo de santos hotel, unfortunately for them they had no idea what was coming, these men (sars officials) came to the scene with the man recording and talking in the background!!!! NEMESIS!!! #slaymama BUSTED!"